I read Widescreen Review magazine because it gives not only in-depth reviews on equipment, as well as new technologies and technical breakthroughs, but also it has the best information on DVD movies in the world!!! Because I love movies so much (I own over 300 DVDs), Widescreen Review helps me decide which ones will look and sound the best without me having to rent hundreds of DVDs each month. 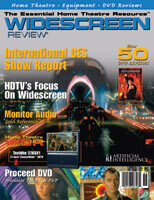 The month is not complete without my copy of Widescreen Review magazine!!! Wish I would get two or three copies every month instead of one!!! Thank you for helping me with my passion!!! !